Welcome to Christ Community Church , the little church with the big heart. Blessing Bags – care packages for the homeless. Fellowshipping with residents in Assisted Living Facilities to make crafts and gifts together. 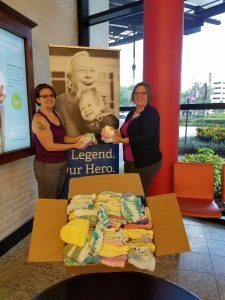 Baby Hat Collection for Orlando area hospitals. Old Blanket Drive for pets in surrounding animal shelters. Teddy Bear Drive for emergency services. Through joyful worship, spiritual nurture and compassionate outreach we strive to touch the hearts, engage the minds and lift the spirits of all those who attend services at CCC. Our core values are Christ based and Bible directed. We strive, in all things, to celebrate our love of God and be an open, helping hand, not only to our members, but to those who are in need. Foreign Missions at CCC includes daily prayers for missionary friends in Switzerland, Restoration Ministries in India, and Loftstofan Church in Iceland, as well as monetary contributions as needed. Our Foreign Missions has recently become more focused upon praying for Persecuted Christians in different parts of the world each and every day. Many thanks to Pat Oreskovich for leading this significant and much needed vision of praying for our fellow brethren in Christ.